This round-topped stela is divided into three sections. At the top is a large curved hieroglyph representing the sky, below which is a winged sun-disc from which hang a pair of uraeus serpents. The hieroglyphs identify this as a representation of "he of Behdet," a term for the (originally) sky god Horus; this decoration is extremely common in the semi-circular "lunette" at the top of stelae. The second and third parts are divided into left and right sides, with a scene above and a text relating to that scene below. 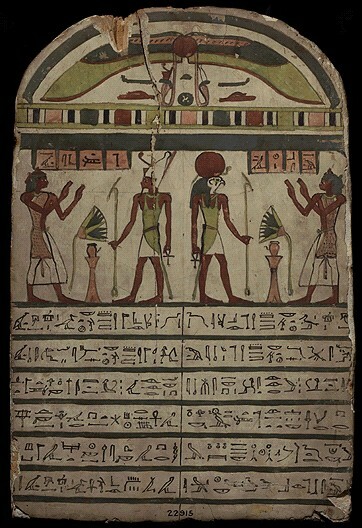 On the left, Besenmut stands in adoration of the god Atum, represented in his usual form of a man wearing the double crown of Upper and Lower Egypt.